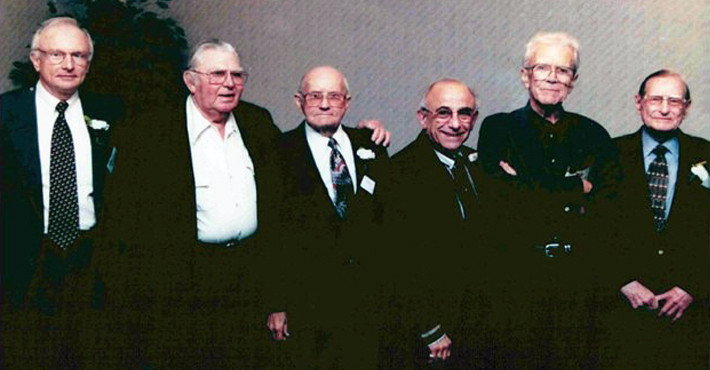 From left to right: Ray White, Andy Griffith, David Stick, Edward Greene, George Crocker, Martin Kellogg. Not pictured: Jack Adams. The Outer Banks Community Foundation was founded in 1982 by David Stick, local author and historian, and six other Outer Banks citizens: Jack Adams, George Crocker, Edward Greene, Andy Griffith, Martin Kellogg, and Ray White. Here’s how it happened. In the spring of 1982, David Stick met with his friend Andy Griffith to interview him for an article. After the work ended, they spent some time talking. Griffith commented that he was so thankful for the support his home community had given him when he first started his acting career, and he wished he could find some way to show the community just how much that encouragement had meant. Stick said he had recently learned about community foundations, and both agreed that this was the perfect method for anyone who loved the Outer Banks to give something back. The friends soon involved businessmen Edward Greene and George Crocker, banker Ray White, attorney Martin Kellogg, and accountant Jack Adams. These community leaders formed a core visionary group, wrote articles of incorporation, developed bylaws, and created the first board of directors of this new charitable organization. In November the group invited the public to a meeting in Manteo and announced the creation of the Outer Banks Community Foundation. The community embraced the concept, and many generous individuals and businesses immediately made contributions and became charter members. Within a few months, the Community Foundation had received contributions in excess of $90,000 and had awarded $10,000 in grants to local nonprofits. Today, the assets of the Outer Banks Community Foundation have reached over $17,000,000. The Community Foundation manages over 175 different charitable endowments, including donor-advised, designated, scholarship, and field of interest funds. The Community Foundation has helped donors give back over $8,000,000 in grants and scholarships to meet needs on the Outer Banks.